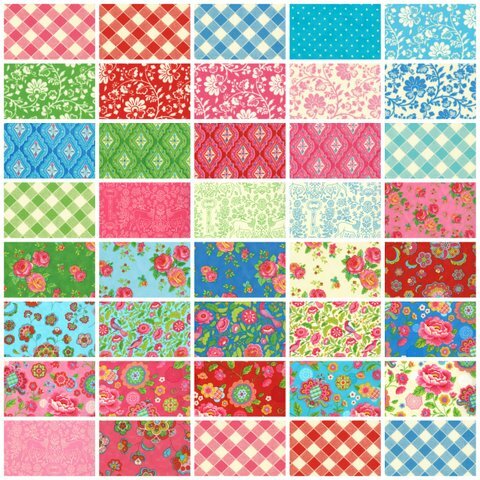 Next week in my little e-shop I will be listing the following pre-release, pre-cuts from Bonnie and Camille, Kate Spain, Lily Ashbury and Julie Comstock. Back in the good ol’ days kids would jump off the bus and run into the house, dropping their books as they went, heading straight for the kitchen. Mom was usually there in her frilly apron, cooking something delicious. Jellies and jams were always a favorite. Depending on the season, it could be strawberry, raspberry, huckleberry or peach. Mom knew just how to make it so that when you spread butter on bread fresh out of the oven and smothered it with marmalade, you knew you were home. Gather together a treasure trove of trinkets, a menagerie of memories and a handful of heirlooms and you get what we call Odds and Ends. 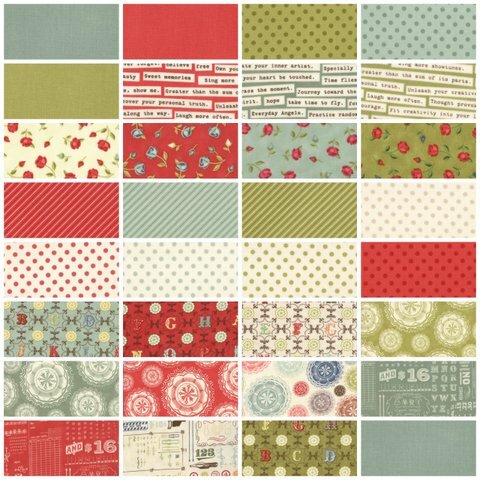 Inspired by vintage typographic elements and antique books, the patterns in this line are filled with historic charm. 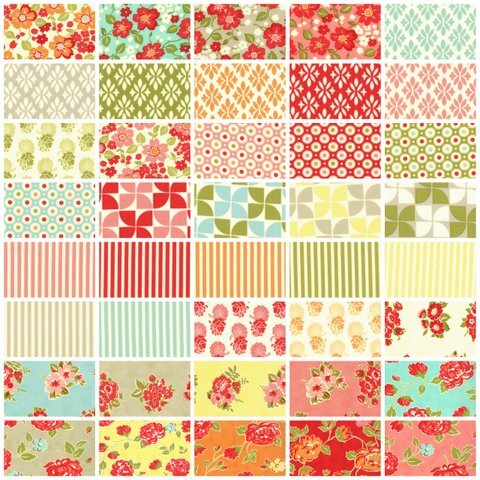 The color palette features a brighter twist on vintage for a fresh, spring-like feel. We hope you love it as much as we do! Remember when you were young and could spend your afternoon weaving a daisy chain or lying in tall grass dreaming of summer romance! Gypsy Girl is inspired by a longing for carefree summer days. Bright and cheerful colors blend together with a warm and youthful charm. With a modern twist, Gypsy Girl will add youthful vibrance to any project, enjoy! As the crisp air of Autumn whirls in, a kaleidoscope of lively colour dapples the wooded landscape in shades of damson, orange and green. Delight in the season’s melodious “Serenade” of migrating butterflies, brilliant foliage and meadow thistles. 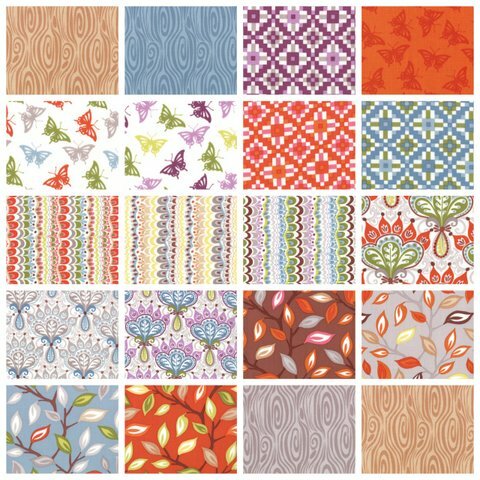 Create a pat work panorama with these harmonious designs, or make your own amusing kitchen apron with the cut and sew panel where a barn owl wisely sings, “Life’s a Hoot”. A bountiful harvest creativity awaits you! If you are planning your Christmas in July projects or getting in early for Christmas, I have some festive pre-cuts in the shop, Joy and Blitzen. Soon to come is the beautiful Aneela Hoey’s – Cherry Christmas. Okay, I am not gonna lie! I want them all! GORGEOUS!! Oh dear I fear for my bank account again! I have just been to your shop, do you have any marmalade jelly rolls?